I don't have time to sit down and pretend like I know how to read these days. Good thing Acclaim Magazine is choc-full of pretty pictures to look at. I managed to get my mits on the new issue before it hits news agencies this week (file that under perks of the day job) and I've been "reading" all weekend. Issue 24 has a fantasy theme. Fantasy is one of my favourite things of all time. My fantasy is a very nerdy variety, the kind you get beat up for in high school: Robert Jordan's Wheel of Time epic fantasy book series, David Eddings' Belgariad books and Game of Thrones TV show. Artist Kilian Eng who designed the gorgeous limited edition cover pictured above. There's an even more limited run of this cover that glows in the dark and will drop in Mag Nation next week! How awesome is glow in the dark stuff?! Nagi Noda who directed one of my favourite music video clips of all time for Japanese pop singer Yuki's Sentimental Journey. She's up there with Gondry in my books. And many many more features including a dream interpretation piece with a boy I used to date, albeit briefly - see my Why I'm Always Single Lady weblog. 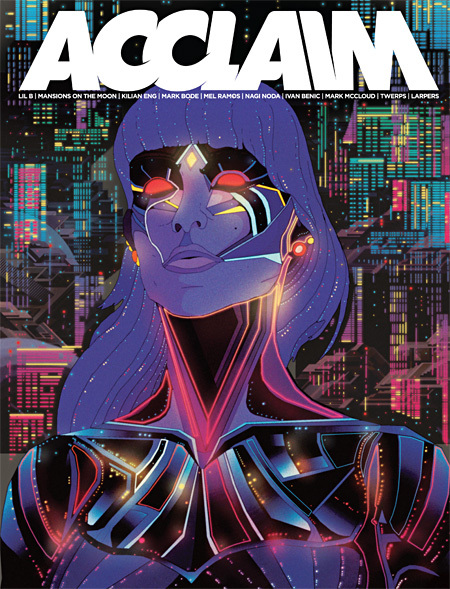 Acclaim is available from Mag Nation (they'll have the special glow in the dark covers), decent news agencies and boutiques with good taste. It's also available on Zinio which is a fancy digital magazine platform that you can read on the computer or on your boss' new iPad.